Although essential oils are widely used in people, the effects of the use, toxicity and effectiveness in animals are not well known. 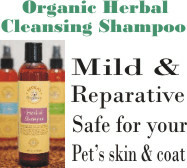 Treat mild ailments like dermatitis, skin itchiness, ear infection, rashes, halitosis (bad breath) in pets, flatulence, burns, arthritis, cuts, and motion sickness. Most people who use aromatherapy for themselves already know the benefits of aromatherapy. Unfortunately, some of these people feel that if it is safe for them, it must safe and effective for their children and pet. Not so. While dogs have been known to tolerate essential oils when used at 1/3 the human normal strength, other pets do not fare so well. In fact using essential oils on other pets such as birds and cats can make them sick. If you have cats make sure that the use of essential oils in the household is regulated because, unlike dogs and human, this type of domesticated animal cannot digest fat. 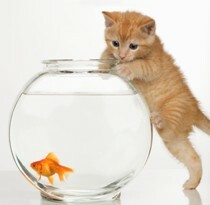 Doing this may be dangerous for your cat. Even though essential oils are natural, you should use them with caution. There have been a number of reports of animals poisoned due to inappropriate use and cats are especially sensitive. Never give essential oils by mouth, or in food. Never use essential oils on animals undiluted. Remember that these animals’ way of cleaning themselves is by licking their fur and if essential oils are induced orally it could be as equally dangerous. When using products infused with essential oils make sure that there is proper ventilation in the delegated area and that the pets can leave the room. Symptoms of toxicity are dizziness, vomiting, clumsiness, lack of appetite and lack of energy. Essential oils are only to be used externally only. Cats’ metabolism of some essential oils' ingredients are very slow. Please allow up a minimum of 48 hours between diffusion to avoid repeated exposure by inhalation. Breathing in any essential oils can harm your cat. The effects of essential oils can build up by repeated inhalation and can cause liver damage over a period time. It is extremely important to know that cats are good with the use of hydrosols. Hydrosols are a safe substance to use around felines. It is mostly water and has very minimal or no trace of essential oil at all. Noting that fact you can justify that hydrosols is best for felines. The convenience of the use of hydrosols is you do not have to dilute it anymore. Please consult with your Veterinarians or an aromatherapist before using essential oils on animals. What I have been told that cats and birds are definitely sensitive while dogs and horses aren't. Equip yourself with good information on essential oils and make sure you test on them first. How to test an essential oils on your pet? For your own blend. Mix a drop of the essential oil or blend of oils of your choice to a teaspoon of carrier oil. After careful mixing apply a very minimal amount of the substance to your pet and observe your pet for up to 24 hours for any reaction. For testing a Pre-mixed blend. Dip your finger in half a teaspoon of the blend and apply it on the skin of your pet. Observe your pet for up to 24 hours for any reaction. What to do if your pet has allergic reaction? Rashes may develop as a reaction to the applied oil. It is best to use olive oil (another carrier oil type) to further dilute the substance applied in the area and then it may be rinsed with warm water. Remember that washing the applied substance directly with water will increase the skin’s permeability and may cause the substance to further penetrate your pet’s system which is the worst thing you want to happen after seeing the allergic reaction. Heavy breathing may also show as another manifestation of allergic reaction to the applied substance. Laziness and being in distress may be associated with the same as well. In cases like this, make sure the substance is thoroughly removed from the spot testing where it was applied and secure the animal to be in a clean and environment free of the allergic factor. These reactions may appear when the blend might be too strong for your pet, or the oils used in the blend might be contra-indicative for some ailments your pet might have. It could also be due to your pet being overly sensitive, or too young or too old to receive an aromatherapy blend, or the essential oil used is not pure. Some essential oils are contra-indicative for certain ailments/illnesses. For example, an animal with cancer might not be able to receive any aromatherapy at all. And certain essential oils may trigger epilepsy attacks. Discover How You Can Use Aromatherapy for Dog's Health and Happiness. Keep your dog healthy by making your own homemade dog treats. What if I say you can put essential oils to prevent them from illness? wanna try? How do you use Aromatherapy for Pet Care? and how your pet react? Tell us here! 5 common dog illnesses you need to know and how to cure it with aromatherapy.